As much as episode 9 hit me in an emotional way, given the revelations that following Ichabod’s death Katrina gave birth to a boy and that the boy has been… missing, I was still unprepared for what happened in episode 10. The big villain this time is the golem that Ichabod and Katrina’s son summoned to help protect him from an abusive priest at a foster-care center. And wanting to find out as much as he can about his son Jeremy, Ichabod asks the Sin-Eater, Henry Parrish, for help and he then goes on to Purgatory to talk to Katrina and get the truth. This episode is all about the pain you feel at the loss of a loved one. Ichabod lost his wife, and now he finds out that he had a son he never knew, a son that he lost. Tom Mison captures those feelings perfectly in this episode. He really makes the viewer feel his pain. This was perhaps the most saddening episode of the series for me. The symbolisms of death and resurrection that have been a huge part of the show thus far pretty much bloomed in this episode. And it all ties in to Ichabod and Abby’s status as the Two Witnesses of the Apocalypse. Jeremy’s existence is just another part of that entire puzzle. This episode also focuses finally on Captain Frazier Irving’s family, with whom he is somewhat estranged. It was nice to see the other side of Orlando Jones’ character. He has been steadily built-up as a strong supporting character and in this episode we see how his newfound belief in the strange goings-on in Sleepy Hollow is taking a toll on his faith and in his religious beliefs. But that’s not all of course. Since he is connected to the Two Witnesses, he has an important role to play in the events that are about to unfold. This is a good tie-up I think and it certainly pays off in the next episode. And since we had the ever-great John Noble back on the show as Henry Parrish, the awesomeness factor was pretty much reading maximum. Episode 11 carries on quite directly with the events of the previous one. This time, we delve more into Jenny’s history with Corben and one of Moloch’s minions, the body-jumping demon known as Ancitif. We saw a glimpse of him in the previous episode where he threatened Irving and his daughter, and this time he is around to make sure that Moloch has what he wants above all: Washington’s Bible, an artifact of immense value to the Witnesses and a major tool against Moloch at the same time. Once again, we get back to the symbolisms of death, resurrection, and pain in this episode. This time Moloch targets Irving’s family because he knows for damn sure that this is his weak spot, and Moloch is always able to hit people where they are weakest. The episode was almost all about this new subplot, and it didn’t really tie-in that well to the rest of the show, but I still enjoyed it. Abby, Jenny and Ichabod team up to stop Ancitif and I liked how the drama between them plays out. There’s always tons of humour when the three of them get together and that’s another thing that I love this show for. Sometimes the humour is morbid, and sometimes its just plain funny. And its always great when the sisters poke fun at Ichabod and his “old” ways or his grumblings about modern life. Doesn’t get better than that really. And finally, we have the finale. There is an absolute metric-ton of plots packed into this two-hour episode. The Two Witnesses have finally begun to unlock the mysteries of Washington’s Bible and this sends them on a search for his grave, the real grave that he was buried in by the Freemasons. Unlocking the mysteries has also meant that they’ve discovered a conundrum: Washington was… resurrected following his recorded death? Its a great mystery, I have to say, and the finale does an amazing job of exploring that. We also finally get to learn about Reverend Nap, who we first saw in the pilot all those weeks ago and who was a guardian placed in Sleepy Hollow by Washington and presumably Katrina’s coven, to stand guard over the town and watch for the Horseman’s return. The finale finally saw the end of Officer Andy Brooks’ character arc. John Cho, who has done some decent work with the character, was at his best here, I think. The material could have used a little work, been less cliched and predictable that is, but all in all, it was good to see him get a resolution in the finale. Some good action scenes were involved as well, in the typical style of the series, and that’s another great thing. But most of all, at the heart of it, the finale gave us a kickass resolution to the story of the Two Witnesses. With the Second Horseman of the Apocalypse, War, due to make his return, and Death already out and about, it is an especially trying time for the Two Witnesses, but this is also them at their best. And Jenny also gets to do her own part here to help discover the mysteries surrounding War’s imminent manifestation. We get hit with revelation after revelation here. The real truth about Ichabod and Katrina’s son Jeremy. The real truth about what happened to Jenny and Abby in the woods that day, when they saw Moloch for the first time. The truth of the identity of War. And so on. It is all a little too much to take in, admittedly, but I loved every moment. Things do indeed come back full circle for the characters. With regard to Jenny and Abby first seeing Moloch, I’m not sure if there’s a retcon involved or not, but if you put that aside, the depth of all the mysteries in Sleepy Hollow is just amazing. Things are pretty damn intricately tied to each other. There are connections between all the characters that were always hidden and concealed in the larger stories of each episode. But its all coming out of the closest. As I expected of a season finale, this final episode of Sleepy Hollow was everything I wanted out of it. It has a jaw-dropping cliffhanger. It has Katrina in it. It gives John Noble some nice action-y scenes. The Horseman of Death returns in a very explosive way. And above all, like I already said, there is resolution and closure to a lot of the subplots that have been running throughout the show. We also get to see how things would have been like for the Two Witnesses, had things gone very differently for all of them. That was a nice emotional touch to the finale, above everything else. But of course, nothing matches the final five minutes of this episode. And with that, I think that Sleepy Hollow made an awesome departure. It ended the first season on a really good note with a great story and with great acting by all the actors involved. I would have loved to have seen more of Orlando Jones’ Frazier Irving, since I thought that was the only place where the finale let me down a bit. Overall, great job by the entire cast and crew. 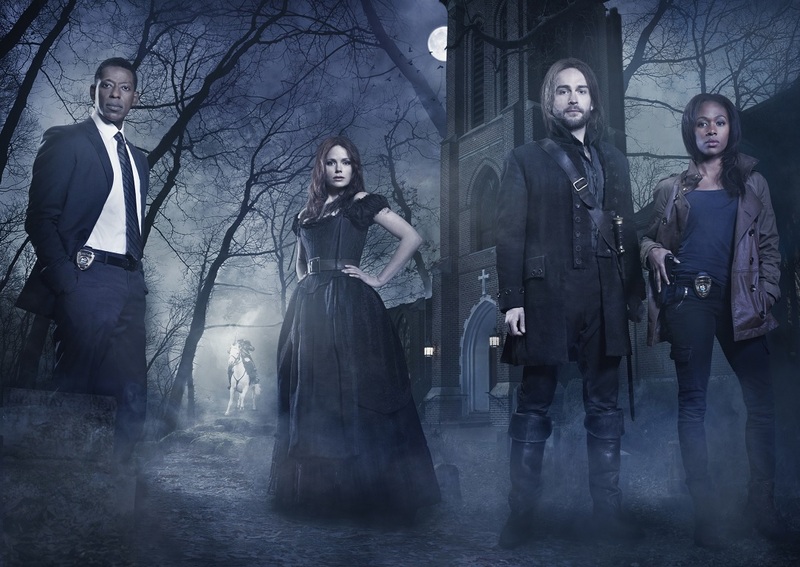 More Sleepy Hollow: Eps 1-3, Eps 4-6, Eps 7-9. Posted on January 24, 2014, in Review Central, Sleepy Hollow, TV Show Reviews and tagged 20th Century Fox, Abby Mills, British Army, Christian Mythology, Civil War, Creepy, Death, Demons, Fox Network, Headless Horseman, Henry Parrish, Hessians, Horror, Horsemen of the Apocalypse, Ichabod Crane, John Noble, Katia Winter, Lyndie Greenwood, magic, Moloch, Monsters, Nicole Beharie, Orlando Jones, Religion, Review Central, Riders of the Apocalypse, Sin Eater, Sleepy Hollow, Sleepy Hollow Season 1, Sleepy Hollow Season 1 Ep 10, Sleepy Hollow Season 1 Ep 11, Sleepy Hollow Season 1 Ep 12, Sleepy Hollow Season 1 Finale, Supernatural, Thriller, Tom Mison, TV Show, TV Show Reviews, War. Bookmark the permalink. 8 Comments.